When it comes to returns, even the most successful companies have them. The important, and sometimes overlooked, part of starting an E-commerce business is nailing down your company’s Return Policy. 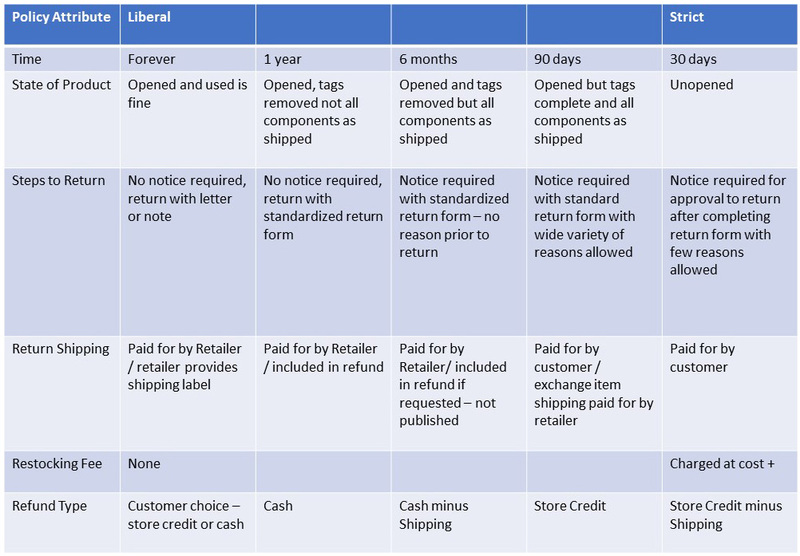 A Return Policy can be as strict or liberal as you see fit for your company. Keeping in mind “92% of consumers surveyed said that they would buy again if the product return process is easy” (as noted in Invesp More Conversions). Developing a comprehensive plan can help reduce the resources you spend on returns and keep your customers coming back. Just because the customer may not be satisfied with their original purchase, handling the return professionally and with minimum hassle to your customer will ensure their continued patronage. Loyalty is earned by providing a positive experience even when your product or service wasn’t a perfect fit. A great place to start is here: https://termsfeed.com/blog/sample-return-policy-ecommerce-stores/ This site will help you create your personalized Return Policy. Issuing returns and refunds is at your store discretion. However, informing of your policies and maintaining fair terms is expected from your customers. While the U.S. does not have federal laws affecting returns and refunds, it’s still a good idea to have a Return & Refund Policy in place.